You will love how easy this palm print pumpkin craft is to make! Big Brother made it while in kindergarten – when they had 40+ students in his class! They were able to cut the class size down at the end of November, but it definitely is reassuring for those looking for a simple craft activity to do with a Halloween party or playdate where there are a lot of kids expected. His Kindergarten teacher made it into a calendar folder by having the sheet folded in half. The pumpkin print was on top and on the bottom was a calendar for the month of October. All the dates were made to be handwriting practice for them. Then they placed all of the fun classwork things they did for the month in that folder to bring home at the end of the month. You will need orange, brown, and green paint. 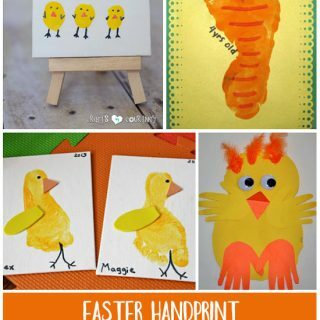 Have the child paint just the palm orange and then make a print on the paper. Paint on a brown stem and green leaf. Alternatively, the kids could paint their index finger to make fingerprint stems and leaves. Once dry, they can use a black crayon to make a jack-o-lantern face if they wish or leave it as is. 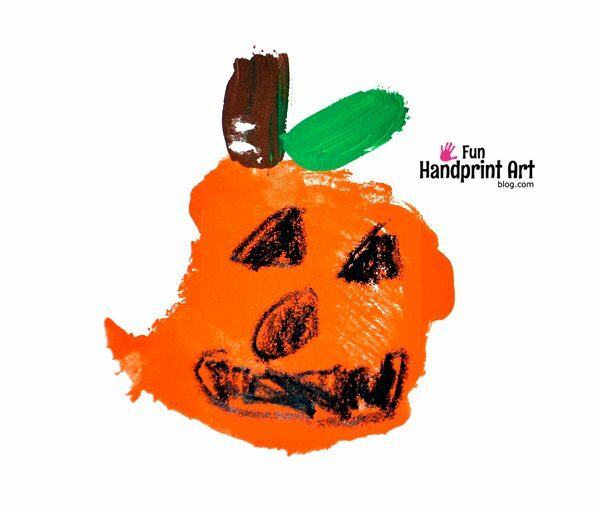 Did you know there are quite a few way to make a pumpkin with handprints? Here are 10 Lil’ Pumpkin Handprint Ideas to make besides this palm print pumpkin! 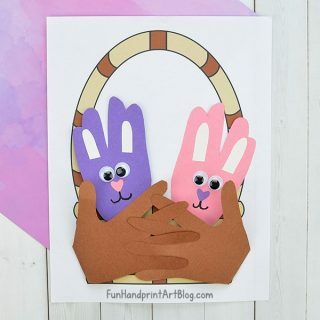 I love following this blog because I love handprint art and you have so many ideas for holidays during the year. Thanks! Awww, this is sweet. Although I can’t imagine doing it with 40 kids! Thanks again for sharing with #made4kids.